earlier editions, coverage has been extended to address the issues raised by readers since the previous edition. In this edition, there is an introduction to the Analysis of Covariance (ANCOVA). Each statistical technique is presented in a realistic research context and is fully illustrated with annotated screen shots of SPSS dialog boxes and output. The first chapter sets the scene with a survey of typical research situations, key terms and clear signposts to the location of each technique in the book. It also offers guidance on the choice of statistical techniques, and advice (based on the American Psychological Association#xE2;#xAC;"s guidelines) on how to report the results of a statistical analysis. The next chapters introduce the reader to the use of SPSS, beginning with the entry, description and exploration of data. There is also a full description of the capabilities of the versatile Chart Builder. Each of the remaining chapters concentrates on one particular kind of research situation and the statistical techniques that are appropriate. 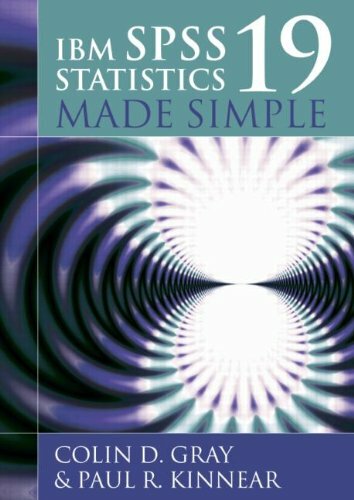 In summary, IBM SPSS Statistics 19 Made Simple Gets you started with SPSS. Shows you how to describe and explore a data set with the help of SPSS#xE2;#xAC;"s extensive graphics and data-handling menus. Helps you to choose appropriate statistical techniques. Warns you of pitfalls arising from the misuse of statistics and misleading graphs. Shows you how to report the results of a statistical analysis. Shows you how to use Syntax to implement some useful procedures and operations. Shows how to use the AMOS package to run path analysis and confirmatory factor analysis. Has a comprehensive glossary. The book#xE2;#xAC;"s accompanying website contains datasets for the chapters of the book, as well as a large body of exercises (with data sets), and notes on statistical terms. Instructor resources include a PowerPoint lecture course and Multiple-Choice Question tests, which are also available free of charge to lecturers adopting the book and their students. Please visit http://www.psypress.com/spss-made-simple for more details. Department of Construction Management and Engineering, University of Reading, UK.